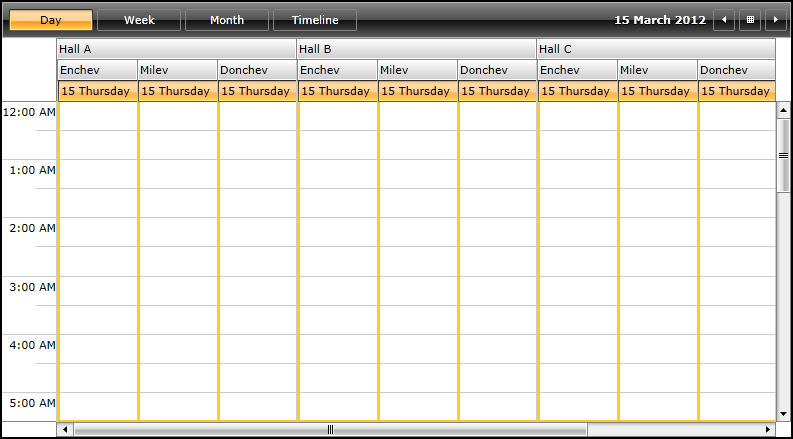 This tutorial will introduce the RadScheduleView, part of the Telerik suite of XAML controls. 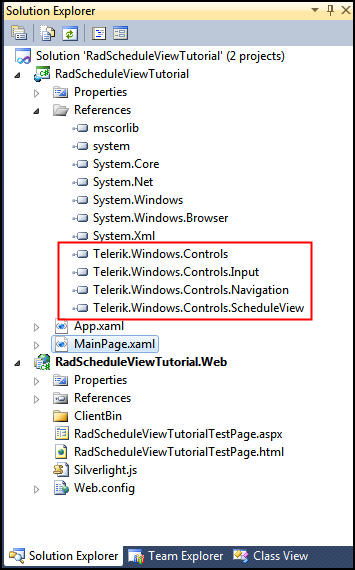 To begin, open Visual Studio and click on the Telerik menu option. Under Rad Controls For Silverlight click on Create New Telerik Project. Name your project, accept Silverlight 5 and in the Silverlight Settings dialog check ScheduleView (notice that the dependent references are automatically checked as well). When you click ok, the necessary assemblies are added to the References as shown in figure 1. The simplest way to get started is to drag a ScheduleView onto the design surface, but to make sure we fully understand what goes into creating a RadScheduleView, we’ll build it up line by line in the XAML. As soon as you add the above code, you’ll see that the designer says Please Provide an AppointmentsSource. This is something that you can do through binding or via code in the code behind. While we are fans of MVVM (and binding to a View Model object) for this example we’ll keep things simple and use code-behind. The first thing we want to do is add some view definitions. 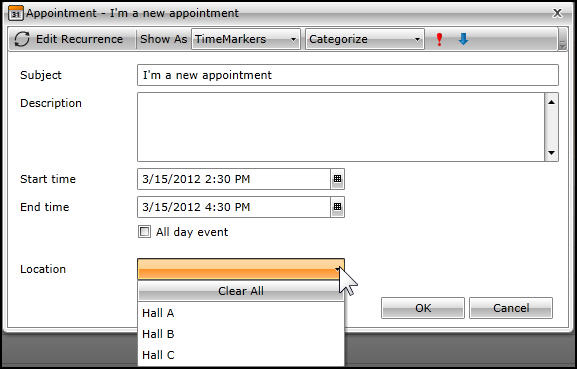 While you are in the ScheduleView, you can double-click to create a new appointment, entering all the details in the details dialog. 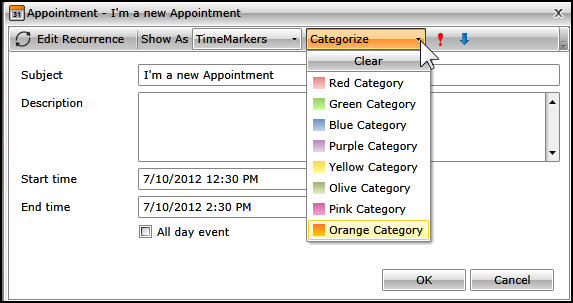 Notice also that you can open month view and just drag and drop an appointment from one day to another to reschedule, and you can click on the x mark (shown when you hover over the appointment) to delete it. Note the type safe call to OnPropertyChanged. This is enabled by a Telerik base class. In the same class, you’ll need to override both Copy and CopyFrom. CustomString = "I'm a custom string"
If you run this, everything works as expected, except that there is no way to see our new custom string. This is because the template for the dialog box does not include a place for the custom string. To do this we want to add the template to our project. You can find the file you need at C:\Program Files (x86)\Telerik\RadControls for Silverlight Q1 2012\Themes\OfficeBlack\Themes\Office\Black (OfficeBlack is the default theme) The file is named ScheduleView.xaml. Add that file to the project. Search again, this time for AllDayEventCheckBox. Let’s steal this row for our custom field. 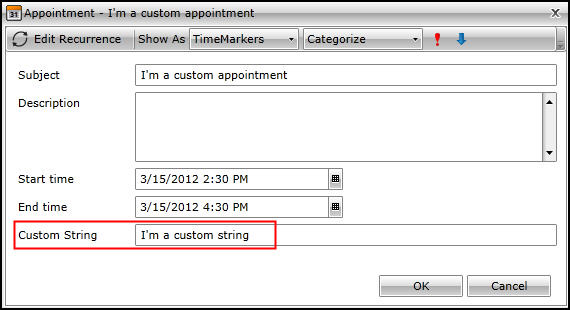 After commenting out the two lines for the CheckBox, add lines for a TextBlock prompt and a TextBox to receive the data. <TextBox Grid.Row="4" Grid.Column="1"  Grid.ColumnSpan="2" Margin="3"
Run the application, and double click on the appointment we hard-wired in MainPage.xaml.cs. Notice that there is now a Location drop-down. Click on it and you’ll see the mutually exclusive choices of the three Halls, as shown in figure 5. To get started, let’s expand on the previous example by adding additional resources. 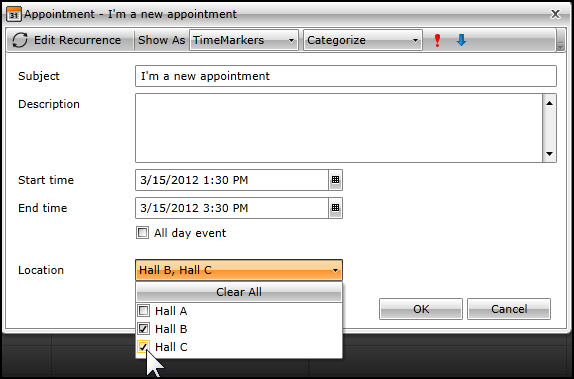 The appointment now shows in both Hall B and Hall C and if you expand or drag either appointment, the other goes with it – it is effectively one appointment across two resources. 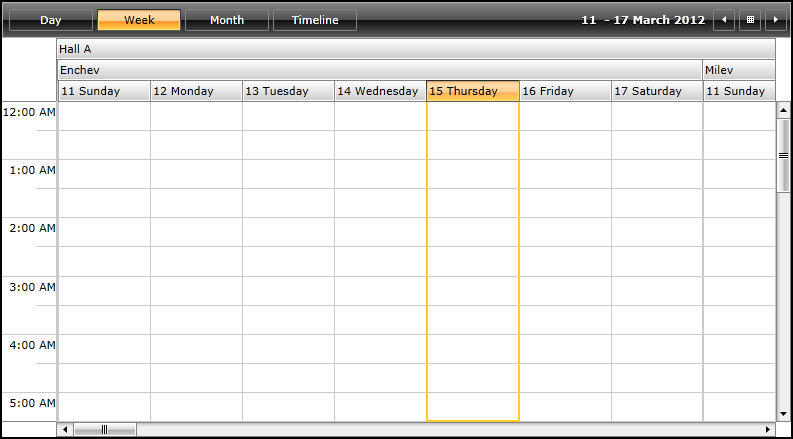 <TextBlock Text="Select a value from the RadComboBox to filter appointments in RadScheduleView by that resource." A Predicate Delegate is a delegate that returns a Boolean value and takes a generic argument. Filter will be a small public method that converts the object we receive (which is any object that implements IAppointment), converts it to an Appointment (which we know is the real type) and then checks to make sure that it isn’t null and that we’re filtering by the correct speaker. FilterBySpeaker is a small public method that makes sure a speaker was selected and returns true if the current appointment resource contains that speaker. Run the application and scroll down to find the appointments. Drag and Drop them into the various halls and note that the Location is updated in the details. Select speakers for each of the appointments. 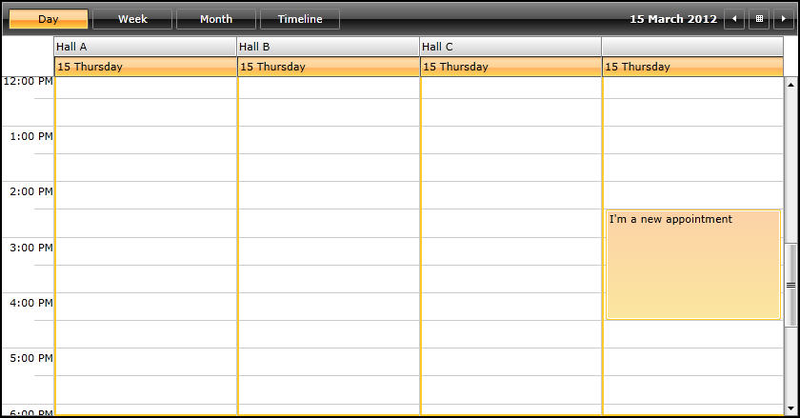 You can now use the drop down to select one speaker and see only that speaker’s appointments, as shown in figure 12.